This is adapted from Phil Robertson’s latest book, The Theft of America’s Soul: Blowing the Lid Off the Lies that are Destroying Our Country, which will be available in bookstores everywhere starting February 5, 2019. Phil Robertson is a professional hunter who invented his own duck call and founded the successful Duck Commander Company. 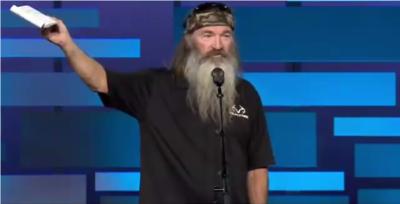 He also starred in the popular television series on A & E, Duck Dynasty, and is now the host of the new subscription television series “In the Woods with Phil” on BlazeTV. He is the author of two New York Times bestselling books, Happy, Happy, Happy and UnPHILtered. He and his wife, Kay, live in West Monroe, Louisiana. Together, they have four grown sons and daughters-in-law, 16 grandchildren and seven great-grandchildren. His latest book, The Theft of America’s Soul: Blowing the Lid Off the Lies that are Destroying Our Country, will be available in bookstores everyone starting February 5, 2019.